In China, the most popular online streamers are not the same as those in Europe! Indeed, while in the West videogamers are the top stars, in China it is farmers who are getting the most clicks. 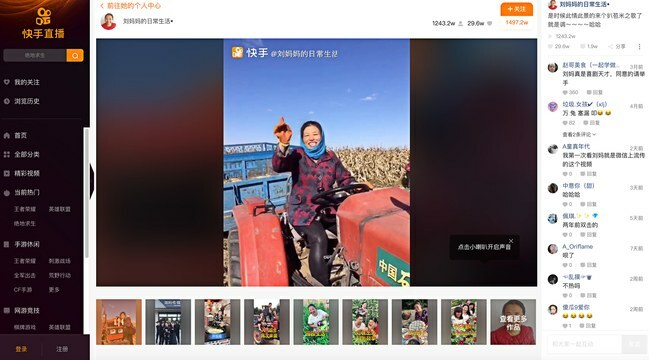 Nowadays, e-commerce sites like Taobao, owned by the Alibaba group, offer everyone the chance to stream, and many farmers have taken to doing just that. It must be said that Web users are particularly fond of this type of content, in particular to understand where their products come from, how they are made and who makes them. Farmers thus have every interest in developing new skills and learning how to run a streaming channel continuously. Take for example Liu Mama, a farmer from the Dongbei region in northeast China, who has become a huge hit and struck it rich in recent years thanks to her short videos. This handmade content is drawing increasing numbers of Chinese viewers who are seeking to return to their roots.